Looking for a matching dining and conversation set and do not want to spend a load of money, try the Mainstays Richmond Hills Patio Furniture with Chair Cushions. You will have a choice of a four piece conversation set with a love seat, two chairs and a coffee table or four chairs and a square glass top table for dining. The metal frames will have a powder coated finish and all the seating areas will have thick tan cushions for seating comfort that can be reversed if it gets stained or torn. Tempered glass tops for the tables will give you some security against breakage. Plastic feet go on the end of each leg to make sure it does not mark you floor area. The price will be on the low end of most sets with these features. You can also purchase the chairs in a set of 4 or the dining table separately for more seating and extra eating areas. To look at my information I have gathered on the Richmond Hills collection follow the information below. The love seat set will come with two straight leg chairs, a love seat and a coffee table. 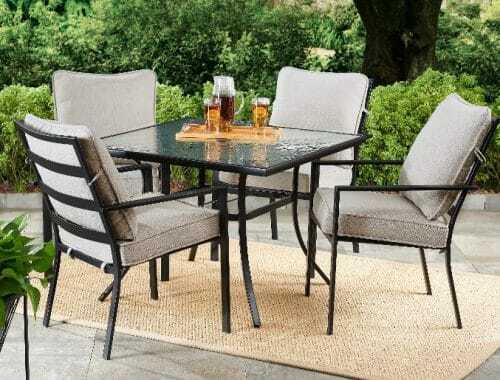 If you have at least a 8 foot square area for patio furniture and just what some place to sit with your friends and family, this set will work well for your patio area. The seating positions will have metal bars to support the cushions. Seat cushions will be a box type with square corners, the back cushions will have a knife edge. They can be reversed if damaged or to even out the wear. Most customers got about four years of service out of their cushions. No direct replacements are available, Walmart does have replacement cushions that will fit in many colors to match any outdoor decor. Each seating position will support 250 pounds of weight. The chairs are 24.25 inches wide, 29.5 inches deep and 28 inches tall. The seat will be 16 inches from the ground with the cushion installed. Love seat will be 45.5 inches wide with the same other measurements. Coffee table will be 32 inches long, 20 inches wide and 18 inches tall, this is a little shorter than some but just as wide and tall. A tempered glass top will give you a great place for drinks and snacks. The four cornered curved legs will have a metal band for extra support, no shelf will be included for this table. This will be a great conversation set with a lot of comfort and style. You will find it fitting nicely in any area that is 8 foot square or bigger. It will come in one box that is about 50 pounds with measurements of 40 inches long, 30 inches wide and 20 inches tall. It may not fit in most cars, a SUV or Truck will be needed to transport if you are picking up. A little assembly will be required, all tools needed will be included in the hardware kit. 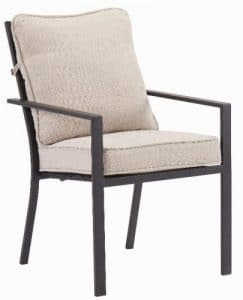 If you do not find this is the right Patio Furniture with Chair Cushions, you can look at some other information on metal conversation sets in my post here. This is a new set for this year, The same chairs from the conversation set are used with a bigger table. The four straight legs chairs will fit nicely under the square glass top table with provisions for an umbrella. The table is a great size for meals at 38 inches across and 28 inches tall. 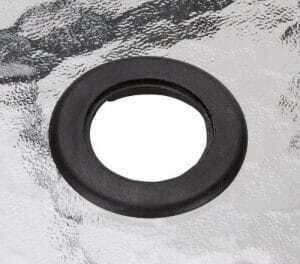 A hole in the middle with a plastic grommet will give you a place for a 8 or 9 foot patio umbrella. The lower leg support will have a place for the umbrella pole to slide through for more stability, you should still have a stand for your umbrella for the best results. If you do not what to use an umbrella, there is a plug for the hole in the table top. For some ideas on patio umbrella styles and colors, look at my post here. Look at the details for the chairs in the above section on the conversation set. The ideal setting will be a space that is at least 8 foot square and fairly flat. As with the conversation set, some assembly will be required. If you would like to look at more ideas for patio dining sets, see my post here. If you are looking for matching dining and conversation furniture for your pool side or patio area, the Richmond Hills collection of Patio Furniture with Chair Cushions will be a low cost option. With seating for four for each set and tempered glass top tables, you will get standard seating and a great looking table. 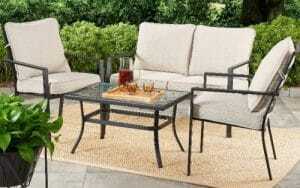 Buy both and get matching furniture that will be all of the furniture you will need for your patio areas. I hope that you found my information helpful, if you want to add to this or have a question use the forms below and I will get back to you shortly. Love the patio furniture with chair cushions John! Used to have a set just like this in our backyard when I was younger and they are amazing! Great for being able to go outside on a nice summer day, drink a cup of coffee and get some work done! I love the powder coated finish on the metal surfaces as it helps to keep the metal almost new for quite a while. This seems like an amazing set. Thank you for yet another great review John! The powder coating is across almost all of today’s patio furniture. This finish holds up well in most outdoor conditions. It does get damaged by the owners more than the weather. Any cleaning chemicals will damage this type of paint, it will discolor and start to peel. A lot of people blame the maker for a bad product when it is their own fault. Absolutely love your patio furniture, and great to see that it will withstand those with a large frame! My partner is on the heavy side, these look resilient, strong and elegant. With the added feature that the legs will not scratch the flooring. Bumped into this site and glad I found you! I always try to include the weight capacities of each piece. Some of the larger people really have a hard time finding the right patio furniture that will hold up to a heavier person. I’m looking for a table/chairs set for my patio area and I like the two options you have above, but can you recommend something similar but for a smaller area? Our patio is probably 8-10′ x 6′ and it’s made of this rubber tile stuff. The furniture couldn’t take up the whole area since there would need to be a clear pathway to the steps leading up to the porch. Basically it’s a small area, but it would only need to seat 2-4 people. It’s fully outside, no covering. We just moved in last summer and our yard is bare. I would look at a metal bistro set with extra chairs. My deck at the lake is close to this size and we have a wrought iron bistro set with a small wooden bench. This still gives seating for four and a small table for drinks to sit on. If most of the time you have only 2 people in this area, like I do, I keep two folding chairs in the shed to set up for extra butts when needed.